If you have been seeing small flies or gnats in your kitchen, they’re probably fruit flies. In the high heat of summer, with a bounty of fresh summer produce in your kitchen, fruit flies can quickly become pesky invaders because they are attracted to ripened or fermenting fruits and vegetables. 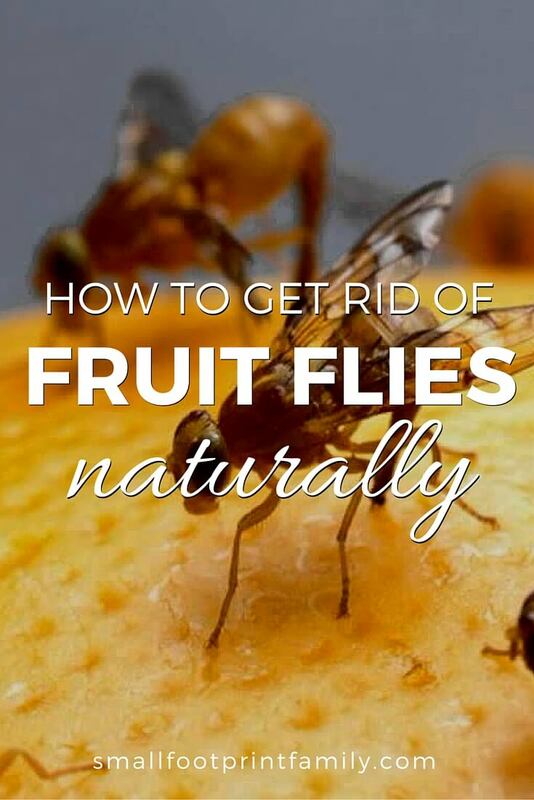 Here’s how to get rid of fruit flies naturally and effectively. Fruit flies (Drosophila melanogaster) are also sometimes called vinegar flies. They are common in homes, restaurants, supermarkets and wherever else food is allowed to rot and ferment. Adults are about 1/8 inch long and usually have red eyes. The front portion of the body is tan and the rear portion is black. 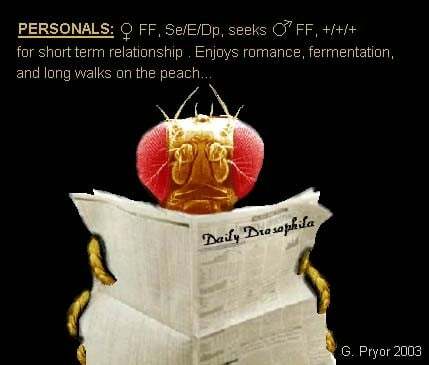 Fruit flies are different than fungus gnats, though they look very similar to each other. 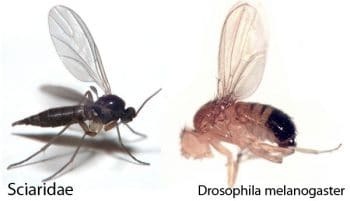 While both insects eat rotting organic matter, fruit flies are specifically drawn to ripening produce and fermenting food and beverages, whereas fungus gnats prefer the rotting organic matter found in moist soil. Fruit flies lay their eggs near the surface of fermenting foods or other moist, organic materials. Upon hatching, the tiny larvae continue to feed near the surface of the fermenting food. This means that any damaged or over-ripened portions of fruits and vegetables can be cut away and composted, and you can still eat the rest of it. Fruit flies reproduce ridiculously fast. Given the opportunity, they will lay about 500 eggs! The entire life-cycle from egg to adult can be completed in about a week. This is why fruit flies are the darling of genetics laboratories. Fruit flies are especially attracted to ripened fruits and vegetables in the kitchen, but they will also breed in drains, garbage disposals, empty bottles and cans, trash containers, mops and cleaning rags. All they need is a little moisture and something fermenting or moldering. Even your moist toothbrush bristles are fodder for the fruit fly! Fruit flies get brought into your home from fruits or vegetables at the market that were previously infested. The adults can also fly in from outside through inadequately screened windows and doors. Fruit flies are primarily a nuisance. However, they also can carry bacteria that can contaminate your produce and cause it to ripen and rot sooner. This bacteria won’t harm you, but it will shorten the life of your expensive, organic fruits and veggies. Good prevention strategies simply keep fruit flies out of your home and off your produce. In addition to removing their food sources and preventing them from getting in, the best way to get rid of fruit flies is to use a trap. If you don’t have the lid or want to make a temporary trap, use a piece of paper or plastic wrap and a rubber band to tightly cover the top of the jar. Poke several holes into it with a fork, skewer or toothpick. Fill the jar with about a half inch to an inch of apple cider vinegar, wine, beer or liquor. Stir in a couple drops of dishwashing soap, then place a small piece of overripe fruit into the middle of the liquid. Make sure the fruit is big enough to stick out of the liquid a little. Place the trap (or traps) where you normally see fruit flies. Every 2-3 days, dump the contents of the jar down the drain or into the compost pile, and start again with a fresh vinegar mix. Commercial traps like these are non-toxic and very effective. These commercial traps are non-toxic and work exceptionally well, but because fruit flies are so, well… fertile, their cost can add up if you don’t also put strong prevention measures into place too. 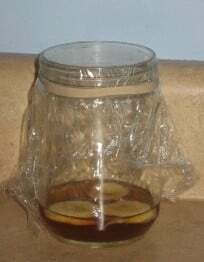 Using a combination of prevention and a good trap, there is no reason to suffer annoying fruit flies in your home anymore. Great tips on how to get this nuisance creatures naturally. I don’t like to use fumigation and I prefer to cover my fruit bowl or store all my fruits in the refrigerator. Hi, I read your article on giving up water in plastic bottles. Now I’m wondering about the plastic particles that are washed into our rivers, lakes and the ocean, when people wash their precious faux-furs. Do you happen to know whether such particles enter out bodies when drinking water from plastic bottles, especially when we reuse them? Thank you for your interesting works. It is very possible to be consuming BPA and other plastic toxins in your drinking water, whether bottled or from the tap. This is why a good water filter and a glass or stainless reusable bottle is the best way to drink water. Thisbis the craziest thing I’ve ever heard of! I couldn’t figure out where all these annoying gnats were coming from. I got rid of all my fruit & they were still flying around. So i googled it & saw they are also attracted to wine! Well……i looked on the table & my husband had left his wine glass on the table. Wella! All i had waa some malt vinegar, dawn & a glass jar. Put the cone in & there’s @ least 10 in there now! Hopefully they’ll be dead in the morning! I will get back with a comment as soon as I try a remedy. These little pests are making me crazy. I have already sucked up a whole gang of them hanging out in the kitchen in the vacuum.! Then plugged the hose just in case they tried to escape. 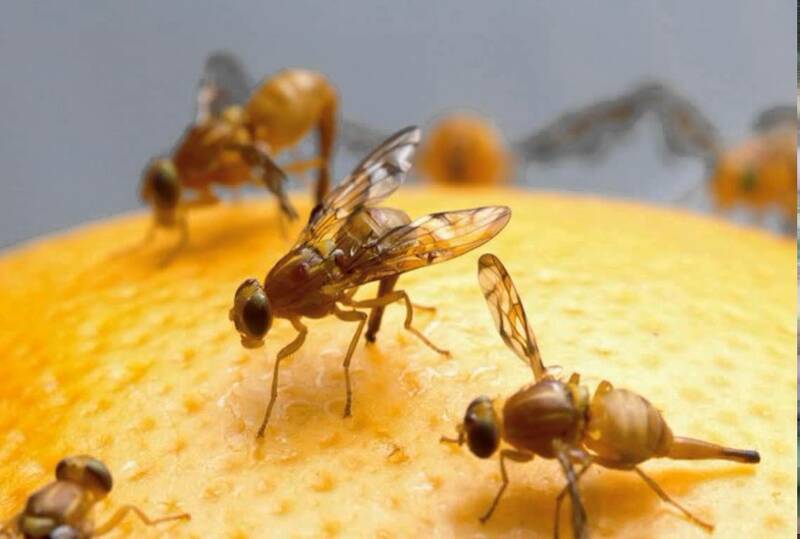 MSN had an interesting article a couple weeks ago about the infestation of Orential Fruit Flies destroying crops in Dade County Fl. 9/24/2015. You want something with some sweetness, like wine vinegar or apple cider vinegar to attract them best. Oddly enough a shallow fruit bowl with a bit of olive oil really gets them. I tryed the vinger trap but used white vingar and no soap or coger. They Would lay on the dish but not get in. Today I’m going to do it right with coger, let you all know if it worked in a couple days. I hate to share my wine with a fly 🙂 but I am going to have to try this! thanks for the great tip! Kombucha also works great! I just put some in a small dish with a couple of drops of Dawn and pretty soon it’s filled with drowned fruit flies. It’s a very satisfying sight! The apple cider vinegar with some dish soap DEFINATELY works.. I just use small bottle lids (Like from my Kombucha etc).. Will have to try a bigger vessel like a canning jar. Another thing that has helped snag a bunch is an old fashioned fly strip.. Know it seems yucky having one in the kitchen, but with a messed up screen door at the moment.. I end up with flies in the house when I don’ t have the AC on… So.. have one hanging in the kitchen. Thanks for the post. Fruit flies also love wine. If you have a bottle of wine that’s “turned” you can leave the bottle open and use it as an effective fruit fly trap. This is a great idea! Thank you for sharing on Saturday Show and Tell. I hope you’ll join us again this week with some more great ideas! You’ve shares some really excellent tips in this very useful post! 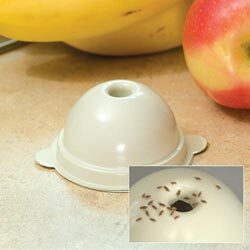 Fruit flies can really be a nuisance, and it is good to know natural ways to get rid of them. Super cool! Thanks a lot! We make the apple cider vinegar/dish soap solution any time we get fruit flies and it always gets rid of them for us! I have never tried to cover it though, but will definitely try next time so I don’t have to worry about my kids trying to drink the “juice” or spilling it :). Great info and perfect timing, though wish I had seen this when I was battling them last week. My solution? A wine bottle with just a 1/2 c. of wine left in it, and a cone of paper stuck in the top. They fly in through the cone and can’t get out. I also sprayed a bottle of 1/2 white vinegar, 1/2 water (usually reserved for cleaning) in the air where they were flying around. They hated it and disappeared quickly. Great inforamtive post with tons of info! I do something similar to this to get the fruit flies we had this year. Thank you for linking up at H2W last week, I hope you’ll join us this week with another great post! Also, this post was chosen as 1 of my top 3 this week, so this post will be featured! Ironically this year we’re not having a problem so much with fruit flies as with ants! But I think I’m bringing them in from the garden (ick)! That is up to you and your kitchen. 🙂 I hang mine on a hook just outside the back door. Dries faster outside too! If you have a big infestation of fruit flies in your drains, you might have to remove all wet towels and toothbrushes from the room after use, until you’ve solved the problem with traps or baking soda and vinegar. So glad to have this info, as I discovered fruit flies yesterday on some overripe peaches. Will definitely be doing this today!! Wow! This is a lot of good information you have here. we do this when we have fruit flies and it works great. Though we just set out the shallow dish of apple cider vinegar and a drop of soap. The flies can’t fly back out. It works fabulously. This was a very informative and helpful post–thank you for the information. By the way, I’m featuring you on my blog tomorrow morning, so come check it out! Vinegar is perfect for getting rid of gnats and fruit flies. Awesome info and solutions. Thanks for sharing. This is great! I love that recipe. I’ve tried this with stale soda (cannot be diet.) It works. These little critters are disgusting thanks for the info! Did not know they had red eyes! Good tips. Glad I found this through It’s a Keeper’s linky party. I linked in a salad using leftover roast lamb. Have a super week. Please feel free to link any other posts you’d like to share! Thanks for sharing…I am not having as many problems with fruit flies this year, for some reason. Maybe the drought conditions are affecting them. 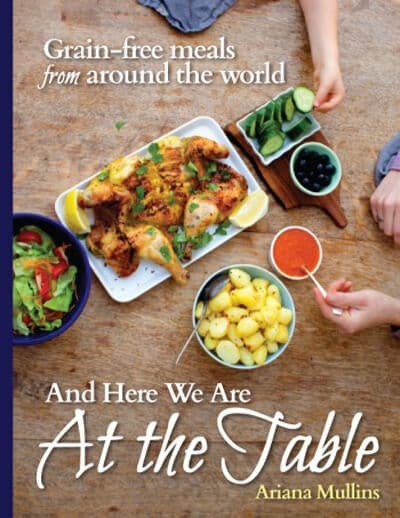 But I usually have them in the kitchen so will want to read this again! Found you on the Wildcrafting Wednesday link! I’ve actually read that, if you are trying to ferment something like ACV, letting a few fruit flies in can speed up the process. I still cover my stuff, but it was a relief last year because I used a cloth with too big a weave and they got into my fermenting vinegar. I kept it, but used that bottle for cleaning and washing. 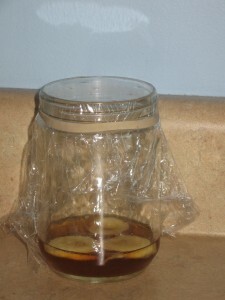 I haven’t had a lot of luck with fruit fly traps, either homemade or store bought. I have actually had the best luck with fly strips. I hung one directly above my sink, front and center. I initially hung it there because there was already something to hang the strip from in that spot, but it worked so well I left it there. Because both the flies (who I bought the strip for to start with) and the fruit flies tend to buzz around over the sink (for different reasons- the flies like the window and the food residue and the fruit flies like the moisture and, well, the food residue as well I guess) it has been really effective, and I noticed diminished numbers of both right away.